Parents needing their children to interpret for them in a custody hearing. A tenant relying on the landlord to explain what the judge is saying in an eviction proceeding. Or a battered spouse unable to understand what has been decided on her request for a restraining order. These are the types of detrimental situations that California courts are diligently working to avoid. A recent survey shows that 51 of California’s 58 trial courts now provide court interpreters for critical civil cases, which include domestic violence, child custody, elder abuse and evictions. In 2015, only 9 courts provided interpreters in such cases. The data is included in a report from the Judicial Council’s Language Access Plan Implementation Task Force. The report details the increased access to interpreters in civil cases and the additional language services provided for court users inside and outside of the courtroom. 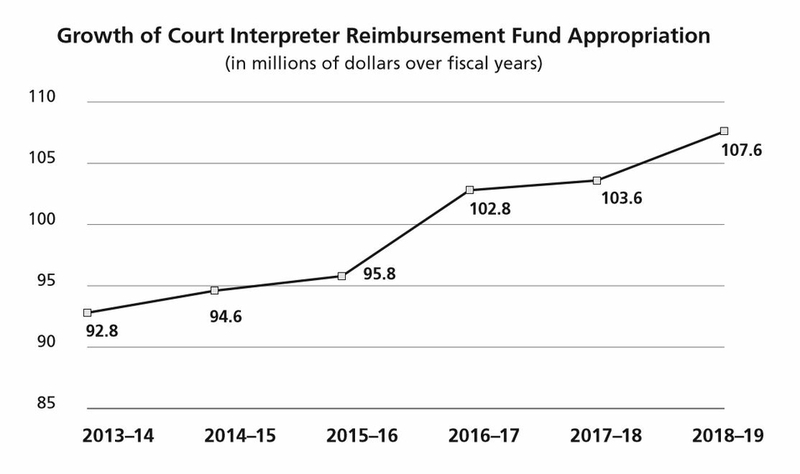 Over the last five years, the Governor and the Legislature have increased funding by $15 million to allow for more interpreters in civil proceedings. In addition to expanding access to interpreters, the courts are putting into practice many of the 75 recommendations included in the sweeping Strategic Plan for Language Access. To date, the task force reports that 35 of the recommendations are completed and 30 more are in progress. Additional efforts to increase language access to the courts include giving training and tips to judges on communicating with limited-English speakers, and providing language help for interactions outside the courtroom, such as at clerk’s counters and court self-help centers. The task force posts a complete list of the recommendations and the progress made on the California Courts website.